I love Halloween for so many reasons…I especially LOVE it for the cool weather..but I really LOVE it for the yummy SMELL of all the pumpkin spices and apple cider etc. I love it also because I can burn tons of yummy candles and I can turn on the OVEN and not sweat to death LOL. Fall is when I kick into full BAKING MODE!!! You will always find some kind of HOMEMADE desserts in my house every DAY! 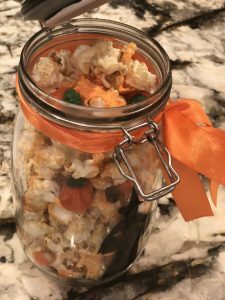 I love making treats with popcorn and adding all the extra fixing. 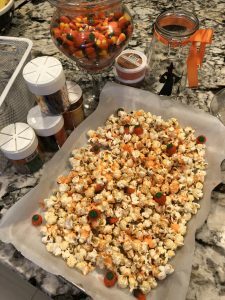 Since my kids LOVE chocolate….I usually alway wipe up a batch of some popcorn and add all sorts of candy and sprinkles mix in…its a great grab and snacks for my kids. Plus, its so festive with all the FALL colors. Cover a 13×9 baking sheet with waxed paper. Make popcorn and lay a single layer on covered baking sheet. 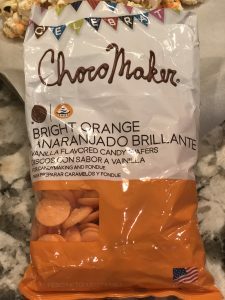 Melt candy melts in separate bowls over a double boiler or in the microwave. Stir frequently until completely melted. Follow the direction on the package. Pour candy melts into disposable piping bags or thick ziploc bags. Use a napkin or towel to hold the bag if it’s too hot. 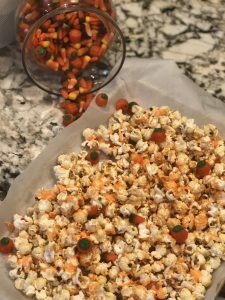 Snip off the tip of the bag and drizzle candy melts onto popcorn. Drizzle the orange candy melts on top. Let the orange candy melt cool then add the candy corns and candy pumpkins. 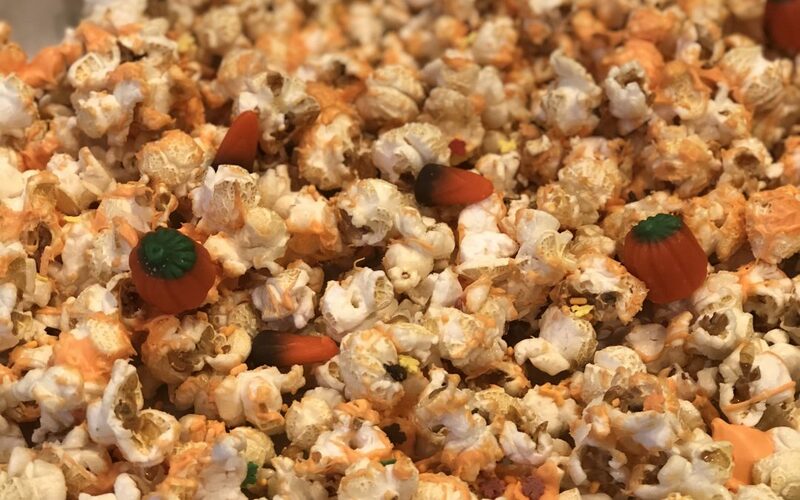 Then sprinkle with Halloween color sprinkles. Allow to cool then break apart and enjoy!